Abcmd.exe can burn image file to optical disc from command line. Using the command line switches, you can set lots of burning options, such as verifying, burning speed, ejecting disc after burning, and etc. -verify: Verify written data after burning. -speed <nn>: Set the burning speed. For example, -speed cd10x, -speed dvd8x, or -speed bd2x. -eject: Eject disc after burning. Example: Burn test.iso to drive G: and verify written data after burning. Example: Burn test.nrg to drive G:. Note: Abcmd can automatically analyze file format before burning. 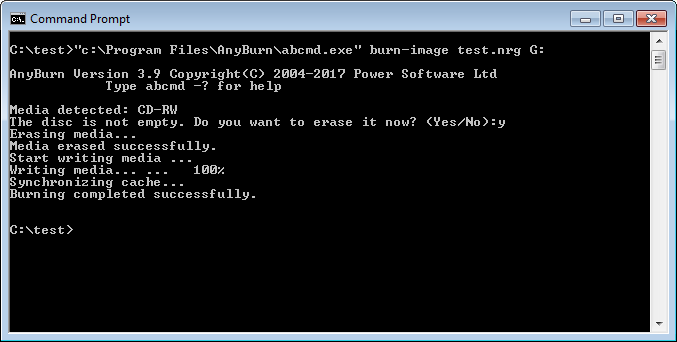 You needn't convert nrg to iso format before burning. Example: Burn test.dmg to drive G:. Note: Abcmd can automatically analyze file format before burning. You needn't convert dmg to iso format before burning.